Painter, printmaker, sculptor and teacher, born in Greenock, Renfrewshire. Was brought up in Northern Ireland, attending Belfast College of Art, 1928-31, then Royal Academy Schools, 1931-5. Lived in France and Italy for three years, helping to run an art school at Pont-Aven, Brittany. During World War II Scott served in the Royal Engineers, a period notable for some outstanding landscape watercolours, having his first one-man show at Leger Gallery in 1942. After the war Scott taught at Bath Academy of Art, 1946-56, where he got to know the St Ives painters. He also taught at the Royal College of Art and Alberta University’s Banff School of Fine Arts. In America he met Mark Rothko, Jackon Pollock and other leading painters and as well as exhibiting at the London Group, of which he was a member, and showing at Leicester and Hanover Galleries, he began to establish an international reputation. 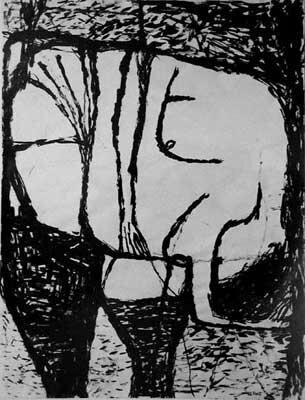 Exhibited at Venice Biennale in 1958 and Sao Paulo Bienal in 1961, when he won the Sanbra Prize, as well as in Brussels, Copenhagen, Oslo, Paris, Rotterdam and Zurich. Scott’s Scottish-Ulster background is reflected in the rather austere still lives of pots and pans for which he became famous, although he was capable of employing quite voluptuous colour. Elected RA in 1984, by which time the first symptoms of the Alzheimer’s disease, which prevented him from doing much work in his final years, were becoming evident. The 1950s and 1960s had seen a series of retrospective exhibitions in Zurich, Hanover, Berne and Belfast, and there was one at the Tate Gallery, which holds his work, in 1972. He was married to the artist Mary Scott.